The Final version of the WinXPset. 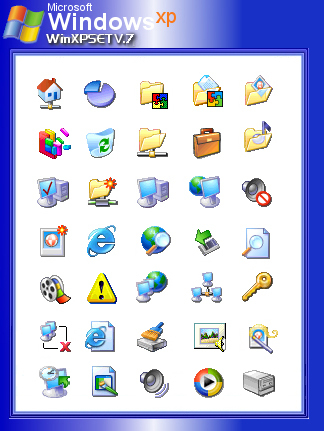 it is now up to 312 icons from Windows XP and includes High res Office XP icons too. Ideally you could update your existing WinXP set to make it easy for users. *Appologies* But I was not able to use the update feature on the skins. So it was uploaded as a seperate set. I just found though that I can now start updating..? Pity really, as this is probably my last version anyway. It's no biggie, we can do a merge. That's what we've been doing since up until a week ago we had to merge them anyway because there was no way to update ones skins, you had to upload a new version as you did here. I was just thinking in terms of making it easier for you. Merging will merge the downloads as well so you'll have 1 skin with tons of downloads instead of multiple. Thanks Froggy!, your the greatist ! I have a question I used this theme and didn't get to see half the icons. I like the little pie graph and the house and I didn't get either of them when I loaded the theme. Would you mind helping me with that? I have posted comments about this on the message board, so if you have any problems please look at the thread about icons! but Flummox I sent you a reply to your e mail and thanks. the icons. It is possible some may still be bad. This will be fixed soon though. But thanks for pointing out the problem. I will see to fixing or replacing the ones that are. I have been asked abot how do you convert the download fle back into a zip. The new version now has all the icons stored into one ICL Library. for better managment, [This is better for Windows To manage in this form too] You will need to rename the file to .zip, and use WinACE to repair the archive to then extract the ICL Library. Any problems please e mail me. you should have collected those (Microsoft Office) icons in a package alone, why users have to download an icon package that they already have only for just few icons added to it? All I can say, thecat2000, is that I'm upset with you. I sent you those OfficeXP icons that I created, and said you could use them in your packs ON CONDITION THAT YOU CREDIT ME for them. I don't see anywhere that you mentioned my name. I am sorry for forgetting you Citezen Tirone,. Please dont feel mad at me for this but I am very busy much of the time working on skins. Besides this I lost your contact address,. Hope you will believe me and dont be upset ! as I acknowledge the fact that you contributed the icons. All I can give you is my appologies and will post credit to you as soon as I am able to. Hope this will help the situation between us. Anyway I have yet again re posted this set, to accomidate the credits I didnt put in earlier due to my forgetting to. ? anyway the real creditors please stand up and take your bow these are the guys who helped with this really cool set! I have downloaded your V7, which appeared to be named V6, i suppose this is not a problem. But what i discovered is that none of my icons (or packages) are displayed in more than 16 colors! And i can't correct this. At least not with Iconpackager. I am annoyed, how do i solve this? The pack you downloaded should not be saying V6. The file I uploaded was winxpsetV7. your problem sounds quite weird but have come across the problem before. I suggest re downloading the set again. try downloading it from deviantart.com too. Just uninstall the old set as it looks like its corrupt. this is a kickass set of icons, i really love this. I downloaded this pack (from deviantart too) but it says V6!! ok to end the confusion on this..The IP theme is version 6 the ICL File that is packed with the Theme has 311 XP style icons within it. the Pack was updated to version 7 when I added more icons to the ICL Library part of the theme. This is where you will find more icons. I'll be doing a completely new Icon set based on XP soon. Which will have a revised Start Menu as well as other icons too.